I have just listened to President Mubarak’s second speech since the events that rocked us on January 25th, delivered on the chilly Egyptian evening of Tuesday, the 1st of February. I watch al-Jazeera Arabic as it shows endless scenes of the crowd’s reactions on the streets of Cairo—specifically, at Tahrir (Liberation) Square, where they report that a million or more Egyptians were camped on this day, which has been declared the Day of a Million Protestors. Interestingly, al-Jazeera and al-Arabiyya are just showing the scenes; as I write this, no commentary has been provided as yet, as if both (proudly) Arab-owned, quality networks are letting the voices of the people, all resonating in a jumbled cacophony of deep anger, speak for themselves. As I listened, and watched the crowds listening, there were several moments in which a sense of disbelief was discernible amid the seething, boiling anger. Midway through the speech, I think that all Egyptians were asking themselves whether it was possible that their leader of thirty years did not hear his people’s demands. Is it conceivable that, despite the whole world having heard the demand for him to go, he would assert that he will remain in his position until his present term is over (in September 2011)? In other words, is it at all comprehensible that the message he is giving to his people is: “I do not care what you want . . . you do not know what is good for you . . . you have been manipulated . . . I will do as I see fit”? Does this Egyptian Nero not realize that he is burning his people? The images being shown on the screen include people taking off their shoes and shaking them at his figure on the screens around them—the ultimate symbol of disdain in Arab cultures. This is a trap. This man [President Mubarak] is setting us a trap. He wants time to take his revenge on us. This speech humiliates us, belittles us, is full of nasty allegations. . . . He is trying to steal our revolution. This speech is a point of transformation in our revolution. He has now solicited our wrath. My grandmother used to say: when God wants to punish a man, He turns his mind against him [makes him lose his sanity]. This is what he has done [acted stupidly]. We will prosecute him. He will be judged; he will be prosecuted for all the countless crimes he committed against us. We will prosecute him. We were being very generous and kind to ask him to go decently. But now we will take to the streets even more, we will prosecute him. No one expected this unfolding series of events—certainly, no one of my generation (those of us in our mid-forties), nor of my parents’ generation, and the generation in between. But the death, in December 2010, of twenty-six-year-old Tunisian Mohamed Bouazizi, who doused himself in petrol and set himself alight, which was soon followed by that of Sidi Bouzid, who electrocuted himself, sparked Egyptian youth into an unprecedented mobilization for radical change—not just political, not just economic, and not only social, but a comprehensive call for the overthrow of a regime that is seen as embodying all that is socially unjust, politically illegitimate, economically corrupt, and legally impaired in Arab societies. The fact that it took all of us by surprise—and this we must acknowledge to honor those who have paid with their lives—speaks to the blanket of despair and humiliation many of us were dangerously comfortable living under. We had become frighteningly accustomed to asking ourselves “What is wrong with us? Why are we accepting this?” It took a generation that has known nothing but the one face of a government that offered them nothing but fear, intimidation, inefficiency, corruption, and injustice. It took this generation’s uprising, which did not make use of any of the generally suppressed traditional venues (political parties, NGOs, even mosques, cafes, and cultural salons) to restore a sense of pride in nations that emerged out of the world’s oldest civilizations. The youth bulge in the Arab world (where nearly 60 percent of the population is under thirty years of age) has produced a dividend of human dignity across the region and way beyond. Regardless of what actually transpires, priceless milestones of social awareness, political savvy, cultural pride, and creativity have arisen. A deep yoke of humiliation—from a fear born of oppression and injustice, from a silence created by decades of clinking chains and printed lies, and from the combined pains of hunger, sexual frustration, and the stigma of poverty—has been thrown off. The process that the youth have engineered and chartered has unfolded with an integrity, dignity, and efficiency that impressed even the country’s toughest institution—the army. From the army emerged the Free Officers movement, which led Egypt’s first revolution against British colonialism in the middle of the twentieth century. Then, as now, the Free Officers stood shoulder to shoulder with the nation’s youth and civic activists. Then, it was an army-led revolution. Today, the army is—ostensibly—protecting the youth of the nation who are leading its people in revolution. 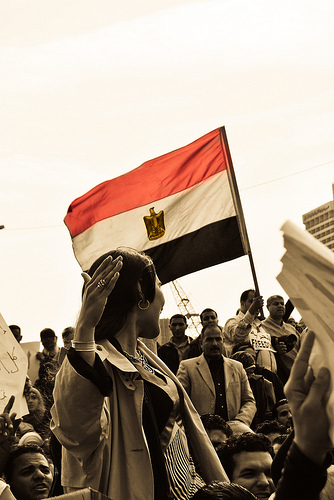 Egyptian youth have organized, deliberated, coordinated, and effectively built—almost overnight—a movement for change. What are the specific demands of the youth? Not only the President, but the entire regime “has to go.” As the motto above makes clear, radical change is required. But the commas, or pauses, separating the various segments of this short motto are not coincidental. In fact, the way the motto is being articulated is itself a declaration of change in action. The people have found their voice, and they announce themselves. Their want, their demand, is not just a matter of a verb or a matter of course; it is the act of making this demand in and of itself that is critical. Finding and speaking their voice and making their demand are part of a revolution that is reversing a long silence and humiliation. And what are they asking for? The downfall of the regime. Not a change of head, not even a transfer of power, but rather nothing less than a radical, comprehensive, and speedy change—the downfall of a way of being. Various opposition voices are elaborating aspects of this call into concrete stipulations, including the provision of a transitional governance structure devoid of Mubarak, constitutional reform, the dissolution of illegitimate legislative councils and the national assemblies, proceedings towards genuinely free and fair elections, and so on. But, in my estimation, the subtext of the demands of the youth is: “Listen to us and respect what we have to say.” However, an ongoing challenge—perhaps one more endemic than chaos, lawlessness, and insecurity—is a continuing attitude of condescension on the part of those representing the regime—the attitude that “offers to dialogue” while keeping the entire regime in place, and with the implication that this is a huge concession on the part of a ruling elite, and that it matters not that the offer to dialogue comes so late in the day. This is precisely the attitude that the youth—and the majority of the people—are decrying. This is the attitude that, if not radically changed to one of humility and some form of contrition, will spell unrest for a long time to come. One of the many aspects of Arab political culture that has been demonstrated in the unfolding events is a remarkable capacity for tolerance, or patience, though some may refer to it almost as obstinacy. But this patience is finite, and people, when pushed, implode and explode simultaneously. Constructive marshaling of these energies has to be systematic, deliberate, and organized, but also humble, because decades of oppression produce social trauma. And, as with any social trauma, its overcoming requires the deliberate devotion of time, active and respectful listening, consideration, and constructive marshaling and deploying of energies into productive channels. The least productive course to follow would be to create more of the same circumstances that induced the symptoms in the first place. And it is even more politically inept to appear not to heed the anger of those who are known to be obstinate. Among the many immediate and long term challenges that will shape the framework of social and political realities in the time to come is the generational gap currently manifesting itself. Perhaps one of the most evident signs of it is the great difference in the reactions to Mubarak’s February 1 speech. The older generation of Egypt’s politicians is reacting in the old manner of being almost grateful that the President even mentioned, or reiterated, some of the demands made by protesters over the last seven days (e.g., to review Constitutional Articles 76 and 77 relating to nominations for presidency and the duration thereof, etc.). Whereas the Egyptian youth (and much of the rest of the population) are livid, the older generation of opposition party leaders is trying to see how they can coexist and make the best out of what the President has offered. The younger generation is refusing to hear or speak of anything short of Mubarak’s resignation, and that is where their energy will be directed in the days to come. As the country becomes increasingly administratively handicapped, only those with the knowledge required to keep social services in operation can attend to the peoples’ needs. Whether we like it or not, the track record in this domain points to the Muslim Brotherhood’s civic and social networks. Given that the older generation of Egyptian politicians is affirming its redundancy, and given the utter lack of contriteness in Mubarak’s speech, there is a very real political vacuum developing, which, in combination with the anger and frustration on display in the streets today, may prove dangerous. “We’ll see who is more obstinate,” as some are frothing, is hardly a constructive plan. And young people who were overjoyed with their coming together are now feeling robbed by their own leaders of their nascent sense of pride and dignity. Unless and until Mubarak steps down—thereby responding to the very basic demand of his people—the cauldron will continue to simmer and may soon spill out into real chaos. Economics Nobel Prize winner Amartya Sen’s articulation of “development as freedom” is being called for here and now. Sen saw human development not as a model of economic reductionism—as some pro-government ”economic experts” on official Egyptian TV have been doing over the last few days (”We were doing so well before this havoc,” they imply)—but as a matter of ethics. Sen saw development as freedom because it concerns the expansion of capabilities, including the capacity to choose between different ways of thinking and living. This is precisely what Tunisian, Egyptian, Algerian, Yemeni, Jordanian, and Sudanese youth are demanding and enacting through their protests. This is now the message coming to be articulated—belatedly—by the (relatively) older leaders of the (relatively) more structured ”political opposition.” Development as freedom is what Arab youth are claiming, and what has to be the roadmap for all policy makers. If the United States wishes to maintain its credibility among the next generation of Egyptian—and Arab—people, then now is not a time to sit on the fence and appear diffident. Sustained pressure from the Obama administration has to be exerted to ”convince” Mubarak to step down—and to do so now. Every moment lost in removing the strongest symbol of oppression is causing not only loss of life, not only mounting internal dissent, confusion, and violence, but, critically, every moment Mubarak remains in power is an opportunity for those calling on God to dominate the emerging scene. There is already a culture of appealing to God (and those who speak in his name) when there is a sense of helplessness. The Egyptian youth who have been fashioning—with their lives—a new discourse of change over the last eight days, without resorting to Islamist discourse of any kind, but with dignity, with passion, with love for their country and their heritage, must not be let down now. If they are, we will have to accept responsibility for allowing the forces of Islamism to step in as the people’s liberator. Meanwhile, a national dialogue, along the lines charted by several opposition representatives (with the military keeping peace and maintaining order), needs to take place. This national dialogue has to include the guidance, participation, and direction of youth leaders across the country. They have already demonstrated their legitimacy on all fronts. They have already started to carve out and lead their people to freedom, and they have earned their right to lead Arab human development. All the opinions expressed in this article belong to the author alone, and do not represent those of any United Nations Institution, Board, or staff member.—ed. Azza Karam Ph.D. is an Egyptian political scientist. She serves as a Senior Technical Advisor at the United Nations Population Fund (UNFPA) in New York. She has also worked as Special Advisor on Middle East and Islamic Affairs and Director of the Women’s Programmes at the World Conference of Religions for Peace and is the author of numerous articles and books on religion, politics, and international development. Very well said—thank you. I would only offer two small comments: First, development AS development OF freedom and capacities (including ethical and intellectual) for all is in the end the only compelling development. Second, the Muslim Brotherhood (not a terrorist organization) is a legitimate member of the oppositional coalition (see Shakman Hurd’s piece), but it does not have extraordinary power. Either they succeed with their comrades from the rest of Egyptian society (including especially the lay youth), or they all fall together. It is not either Mubarak or the MB, but Mubarak or the Egyptian people in all their unity and diversity. But if it is Muburak, then much blood will be shed in the coming weeks and months (even beyond immediate suppression), and it will be shed with U.S. complicity. So I concur fully with the imperative for the Obama administration to act now: force Mubarak down or withdraw aid. I have already written to the President (on the White House website) to this effect, and urge my colleagues here to intervene as well (numbers can mean something). I don’t pretend this would necessarily have any decisive effect on our much-beleaguered President, but I believe we need to overcome our customary reserve and fears and give voice (maybe for once) to our solidarity for genuine political liberation. We’ve already lost too many opportunities. Last summer in Cairo, a street vendor told me that nothing will happen in Egypt unless the American government approves of it. Today his voice reverberates in my head as I’m watching the news. And I don’t know what is more unsettling to ponder: that he may be right, that many Egyptians believe it, or that many Americans believe it as well. Watching the events unfolding in Egypt is emotionally draining. I observe them as a third party to both America and Egypt—I am Polish. (That also means something—I remember army tanks rolling through the streets of my hometown during anti-communist protests in 1981.) At the same time, I have very close ties with both of the places—I lived in Egypt, I have friends there who are close to my heart, and I intend to go there again. But, I am living in America with my American husband and it is my home now. So what have I learned here? I have grown accustomed to the fact that major political events in the world will automatically include American involvement, whether openly supportive, resistant, or both, depending on the economic and strategic interests of the US. The revolt in Egypt has been no exception. International public opinion has been strabismal, with one eye watching the demonstrations and the other following the responses of the American administration. In the first few days of demonstrations, Hillary Clinton called for an “orderly transition” to greater democracy in Egypt, a position that was echoed by her European colleagues. None of them, however, went so far as sending envoys to Cairo, the Administration’s next step. Frank Wiesner, former US ambassador to Egypt, was dispatched to inform Mubarak that he should not run for reelections in September; nor should his son. The White House has also reached out to the opposition. Ambassador Margaret Scobey met with Mohammed El Baradei and a few other opponents of Mubarak to test the waters. More “envoys” from America to Egypt are currently under consideration. And finally, the phone-calls from President Obama and his deputy, new statements from Hillary Clinton, and discussions of reducing military aid to Egypt made it clear that America is going to have its say on the situation in Egypt. Meanwhile, the Egyptian people on Tahrir Square know they are being watched by the rest of the world. Many of the signs photographed and filmed by foreign journalists have been written in English, expressing deep levels of frustration and disappointment. But, the protesters are also eagerly watching the reactions of the world, and America in particular. They are not going to stop their protests, but their expectations, like their hand-held signs, are up in the air. Is it enough to overthrow Mubarak’s regime? The press headlines commenting on the last days’ events make it obvious that a lot depends on the decisive or indecisive stance of the American government. As more blood ihas been shed on Tahrir Square, more support for the Egyptian uprising grows among the average American. Comments posted on blogs and newspaper sites are, for the most part, urging the White House to be more bold in condemning Mubarak’s regime and its assaults on the Egyptian people. Although many Americans see the tradeoffs of such an open confrontation (after all Mubarak did provide “stability” in the region), nevertheless the pressure on President Obama to decisively act is growing. Demonstrations in some American cities and petitions, such as the “Open Letter to President Obama in Support of the Egyptian People” (http://www.petitiononline.com/egyltr/), are adding to that pressure. But as much as I, like many other people, want to see the Obama administration act more decisively (I, too, signed the open letter) I’m somewhat ambivalent and wonder: How long is America going to play the world’s savior? Thank you for the very thoughtful responses. I share the ambivalence about an America attempting to play world’s savior, yet I also believe that if a superpower has actively participated in propping up a regime and a country—both economically and militarily—then whether one likes it or not, it shares in the responsibility to protect the citizens thereof. It is an obligation—moral and pragmatic—that should come with the territory. But the beauty (and/or wonder) of this situation, so to speak, is that the people of the country themselves claim the right to be heard and to have their demands met by those within the country—and those pulling some strings from outside. I cannot say this enough: yes, they have the placards written in English to give the message. The point is, they are making their demands known so that you and I and everyone else will not only know, but seek to support. And good for them! I find the rhetoric of the Mubarak regime concerning “it is either me or the Brotherhood” to be entirely false—and pathetically so. It has been so since the Sadat regime before his. Since I first studied and wrote about political Islam in the mid-1990s, my contention was always that there is plenty of heterogeneity within the Brotherhood itself—including within its cadre of women’s rights activists (whom few are comfortable to acknowledge), some of whom have plenty to say about its political ethos and governance methods. My concern here is not that the Muslim Brotherhood will “take over.” Rather, that the longer the political stalemate appears to extend, the more the entity with the most experience in organizing the street (and clothing and feeding and arranging for transport to and fro) may be given a relative advantage vis-à-vis the other protesters—who are even more heterogeneous and diverse within their ranks. But I am equally concerned that some of those among the traditional secular elite (who never once dared to organize against the regime in its heyday) will now seize the momentum and, being already established within this behemoth of a manipulative network (i.e., the regime), start to hijack the discourse of “the opposition,” including the few token “youth representatives” to add to their legitimacy. Given a choice between the Muslim Brotherhood and those old/new faces seeking to hijack the protest discourse, I wonder whom the large majority of Egyptian people will instinctively feel closer to? Having said that, I think it is important for us to realise that the MB is not a bogeyman, they have been a de facto political party for a very long time. I see them moving more along the lines of the AK Party in Turkey—in yet another distinctive format—but one that does not spell “doom and gloom,” as some would have us believe. Last but by no means least, the point is: the revolution IS. We are already discussing, assessing, evaluating (and some are celebrating, thankfully) the alternatives. No small feat when, less than one month ago, it was either Mubarak senior or Mubarak junior.